At one end of the Restaurant Ambition Scale you have a simple street food stall, where a small team - often just one person - tests the market with a highly specialised menu of variations on a theme; burgers, perhaps, or Korean-French fusion Yorkshire pudding burritos. Success at this level may lead to investment and expansion and - for the lucky ones - a nationwide chain of restaurants, but none of this happens overnight. Word of mouth travels slowly, and success has to be earned the hard way. At the other end of the scale, there is Hide. Occupying three floors of an imposing tower block in the heart of Mayfair overlooking Green Park, consisting of a basement bar, ground floor bistro and mezzanine fine dining restaurant, there is nothing about the place that isn't lavishly, indecently confident bordering on downright reckless. As most of the London restaurant industry prepares to batten down the hatches and prepare for the long, dark Brexit winter of the soul, Ollie Dabbous and his Russian investors have decided to throw caution (and a few million quid) to the wind and open by what is by some distance the most impressively kitted-out bit of foodie real estate in W1. Outside, it's fairly discreet - austere, even, with tinted windows only hinting at activity within, and a large unmarked entrance of dark panelled wood. Inside, though, you can see where every last penny of the £millions went; a glorious stylised wooden staircase looking like something from a Guillermo del Toro movie is the obvious centerpiece, but lovely design details lurk in every corner and it's worth factoring in a good ten minutes into your evening schedule just to make time for gawping in slack-jawed wonder at it all before turning your attention to the food. Mind you, the food served at Hide deserves just as much slack-jawed wonder as the surroundings. 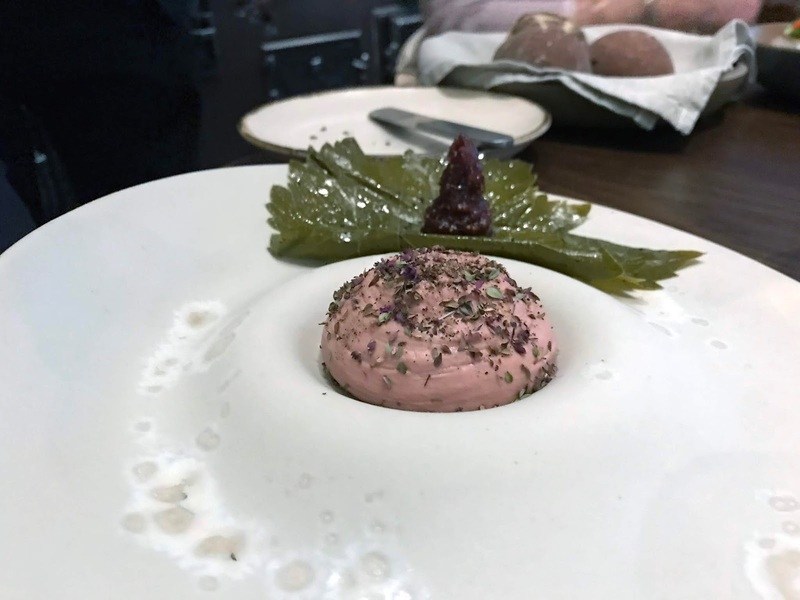 The artist's eye and attention to detail that made Dabbous such a roaring success is even more amplified here, and even this cynical, restaurant-weary blogger saw several moments of genuine, game-changing innovation. Even the bread course was pretty much perfect, all of it oven-fresh and beautifully done, particularly a "foccacia" so insanely delicate it practically dissolved in the mouth - pure buttery, flaky joy. Simmental (there's that name again) beef tartare came wrapped in cute little nasturtium leaves secured with mini clothes pegs, and despite the leaves being slightly wilted and past their best, still made for very satisfying little morsels. I couldn't detect much of the advertised 'tobacco' flavour but perhaps that's for the best. 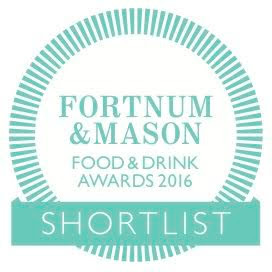 Cornish mackerel tartare was served with one of those clever Pacojet-made snows, flavoured with eucalyptus. I don't know if you've ever had mackerel and eucalyptus before - I very much doubt it - and I still haven't, as I didn't get to try this one, but I am reliably informed it worked very well. And who can resist a moat of seaweed and dry ice, to lend a creepy B-movie atmosphere to proceedings? At this point, my camera battery died, so I'm afraid from here on photos will look like they have all the life drained out of them, as the iPhone in low light tends to do. 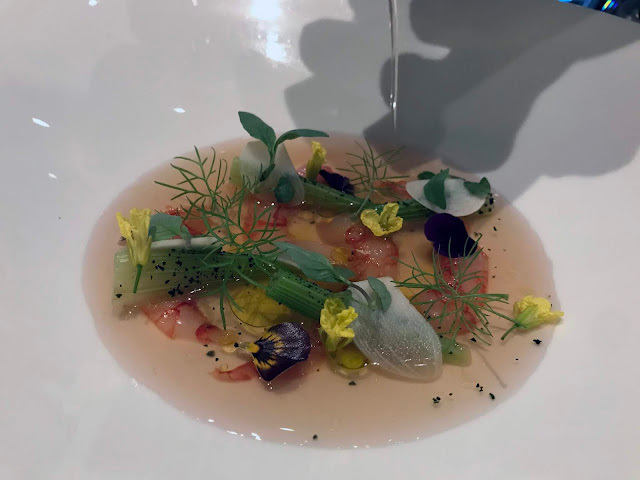 So just imagine how vibrant the colours were in real life on this dish of raw red prawns, and how a cool, clear shellfish consommé brought a refreshing spritz of the ocean. Chicken liver parfait was actually nowhere near as weird and grey as it looks here; it was in fact a very attractive pink-bronze, smooth and light and perched proudly on the top of a clever bit of custom tableware, as if nestled in the caldera of a sunken volcano. Under normal circumstances a single "sweetbread" may sound a bit of a stingy portion for a main course, but this thing was huge - not overwhelmingly so, and with a fantastic light texture, but plenty enough to satisfy. It was presented with angular spears of various pickled herbs and vegetables, and over the top was poured one of those dense, meaty sauces that you just want to order a dozen gallons of and bathe in. Actually, maybe that's just me. Sorry for the mental image. 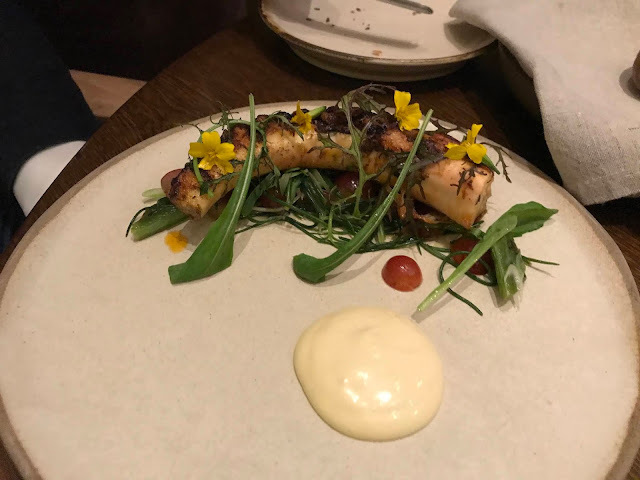 Octopus was right up there with the version served at Holborn Dining Room, which means it was pretty much perfect. Beautifully tender and darkened with charcoal smoke, it was like sitting on a Mediterranean beach next to a wood fire at sunset. Alright, maybe not quite like that, but it was a very good bit of octopus. Even the more straightforward dishes were never anything less than impressive. Herdwick lamb, presented in three neat sections, was perfectly cooked and boasted a texture firm yet so yielding it could almost be cut with a spoon. 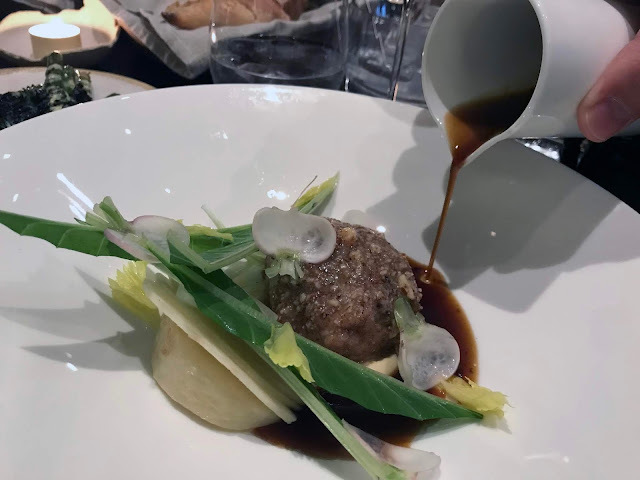 It was clearly excellent lamb - the attention to detail, from everything from the very obviously flashy presentations to the more subtle efforts in areas like sourcing - was quite something to behold. 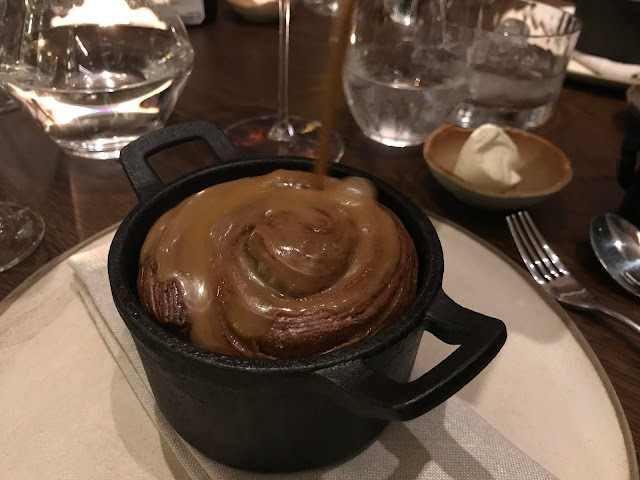 We could hardly leave without seeing what magic Hide could bring to desserts, and "warm acorn cake" turned out to be a kind of rum baba, where smoked caramel was poured over the cake, itself soaked in a generous measure of your choice of rum. Whether by accident or design, our waiter left the rum bottles on the table during dessert, and it's probably only fair to point out we may have snuck a couple of extra measures before the meal was done. I didn't see the bill - I was lucky enough to be treated to dinner on this occasion, and though this wasn't a PR invite I thought I'd mention it anyway. But it's worth saying that, really, for food of this precision and skill, in such blindingly attractive surroundings, in this part of town and presented by a team so relentlessly lovely and enthusiastic about the food and drinks they serve you feel a bit mean for not inviting them to sit down and enjoy it with you, well, I think the £100/head or thereabouts feels like something even approaching a bargain. Certainly there are far worse, and far more expensive places to eat within easy walking distance (*cough* Novikov *cough*). So I can wholeheartedly and unreservedly recommend Hide. 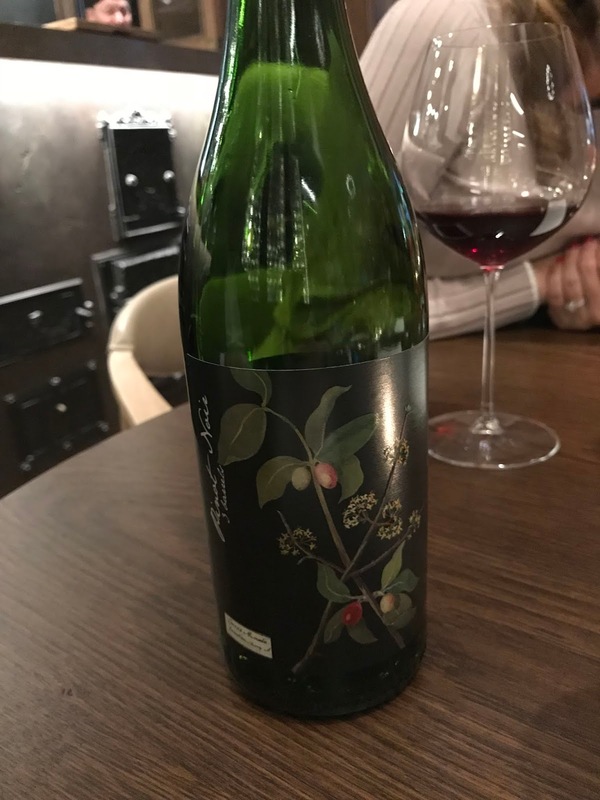 It hits every single restaurant pleasure point with a bullseye, and if you have the means, and enjoy eating lovely food served by lovely people, then it's hard to see why you'd leave the place any less impressed than I did. And I was very impressed indeed. So thank you Ollie Dabbous and team - it's reassuring that in these difficult times, there are some people willing to aim big, and have their lofty ambitions realised so perfectly. Despite never having been to White City Place before, the vibe of the place felt eerily familiar. Originally a collection of BBC buildings, the writing was on the wall for them remaining so as soon as the price of a two-bed flat in Zone 2 spiked over £750,000 and so today they've transformed into yet another one of those wipe-clean reimaginings of a public space, still technically public domain but heavily stacked with lots of lovely investor-friendly residential blocks. See also: Battersea Power Station, Stratford Olympic Village, and so on. Of course, though billions are to be made in residential housing, not even an absentee Saudi landlord would want to own property in a windswept concrete jungle with only a branch of Tesco Express and a Pret for entertainment, so more often than not these developments offer a sweet rent deal for half-decent restaurants, so they can pretend to be a normal functioning neighbourhood at least for as long as it takes to flog the apartments above. So Battersea Power station boasts - for now - a (very nice too) branch of Wright Bros, Stratford Olympic Village has Darkhorse (which hosted a popup by Henry Harris while he was between Racine and Coach, Clerkenwell stints) and now BBC Media Village - sorry, White City Place - has Wellbourne. Wellbourne is, objectively, a nice restaurant. True, at first glance the menu appears to be rather unfocused, with various French, Italian, Spanish and Middle Eastern elements vying for attention, but anywhere serving Ibérico secreto and veal Holstein clearly have a bit of ambition about them, and with a Josper-style charcoal oven in the kitchen they've at least been able to spend some money on equipment to - in theory - make the most of it. All of which may even have not been enough to tempt me to W12 were they not able to offer a type of cow I'd not seen on a menu before - 50-day-aged "Simmental" beef from HG Walter, a butcher already in my good books for supplying the astonishingly good burgers served by Harris at the aforementioned Coach in Clerkenwell. So with that, I hopped on the Central Line. Before the steak though, some vol-au-vents. Every restaurant needs a USP, and it seems the team at Wellbourne (including the most affable Michael Kennedy who was in the kitchens the evening of my visit) have pinned their hopes on the humble vol-au-vent making a comback. And why not, because these were perfectly lovely little things, boasting good buttery casings and intelligent, well-seasoned fillings of lamb shoulder and mustard, salt cod, and (my favourite) broad beans, sheep's cheese and mint. That I enjoyed my steak as much as I did is testament mainly to the quality of the raw ingredient, as I had various issues with the way it was presented. By all means serve steak on the bone - it's my preferred cut - but if you're going to cut it off said bone before serving, do not then re-grill the steakless bone (!?) to remove all trace of nice pink flesh, and do not drape the filleted beef over the bone on the plate, like it had all been dropped from the ceiling. Added to this, there wasn't enough of a crust or colour on the steak itself, which ended up looking a bit sad and flabby. But! But. It still tasted great. 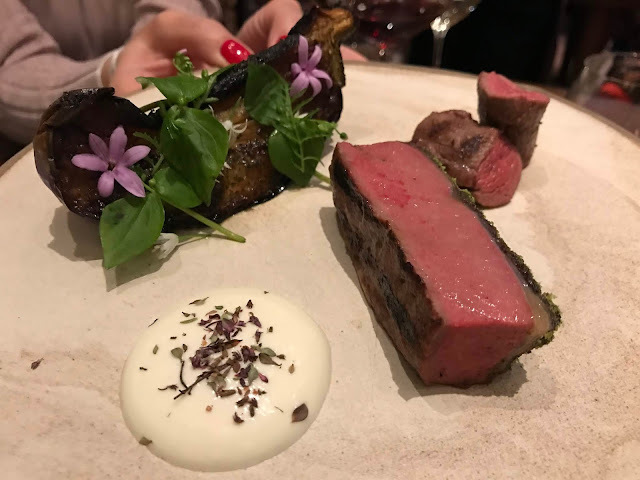 This was clearly very good beef, and despite all the indignity it had suffered in the cooking process still managed to boast a dense, rich funkiness that only the most carefully-aged cow can. Simmental, interestingly, are mixed-use cattle that can be used for dairy or beef, much like the Galician breeds you find in so many trendy Spanish steakhouses these days (Lurra, Sagardi) and I don't know whether it's just a happy coincidence that this happens to chime with exactly what I'm looking for in a steak, or there's something about ex-dairy cattle that makes incredible beef, but I was more than impressed. Veal Holstein was also a good example of its sort, carefully and prettily presented, tender veal schnitzel seasoned with good strong anchovies. And at the risk of repeating myself, how nice that a new bistro like this is making the effort to do something a bit unusual rather than filling the menu with burgers and Ceasar salads as I'm sure they could easily have done. Oh yes, chips were very nice - neat and golden brown with a good crunch - though I preferred dipping them in a red wine jus than something called "bois boudrin" which had all the personality of cold Doritos salsa. 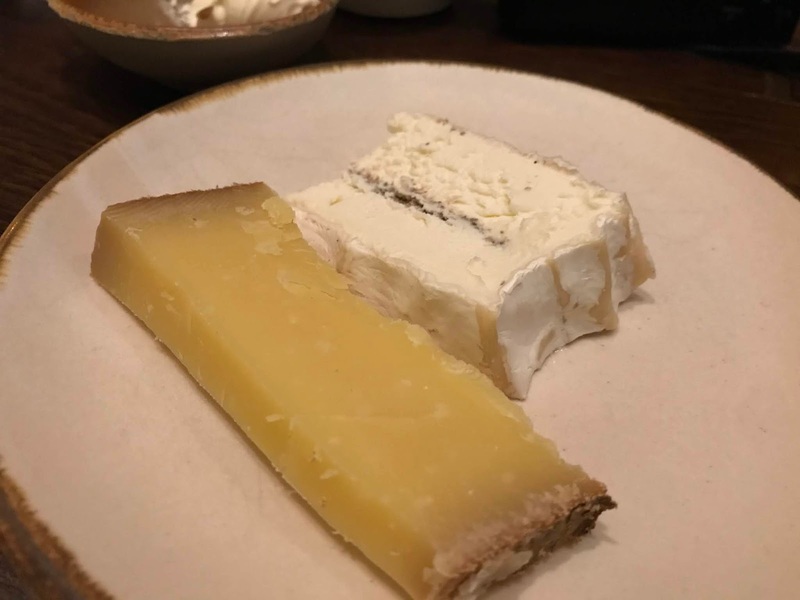 Fortified by good meat, as well as a glass of very good Napa red from their Coravin system, we felt comfortable enough to stay for desserts. "Dolce[sic] de leche" ice cream sandwich was excellent, soft inside without a trace of crystallisation, and with a nice salty crunchy biscuit. So too, lemon leaf sorbet which had loads of citrus punch and a smooth texture. The less said about the attempt to pair the ice cream with a dry manzanilla sherry, though, the better - a sweet port, hastily substituted, soon put things right. Overall, then, there was enough to enjoy, and though clearly I can't be giving top marks to anywhere serving steak like that (if you like, see how different it looks on the restaurant's own website - wait for the 3rd slide), the quality made up for some of the texture and you can still do a lot worse for the same price elsewhere. Whether it will survive in this strange, lonely spot once the rents go up - we were one of two tables taken all evening - remains to be seen, but it's probably no safer than anywhere else in London at the moment, Saudi investors or no Saudi investors. So better just make the most of it all while we can. I was invited to Wellbourne and didn't see a bill, though I imagine all of the above would have come to about £50/head or so.